Tawang Hill Station is situated Arunachal Pradesh state of India, at a height of around 10000 feet (3500 meters) above sea level. Tawang was captured by China in 1962 during the India-China war, later on China has withdrawn its troops from Tawang. 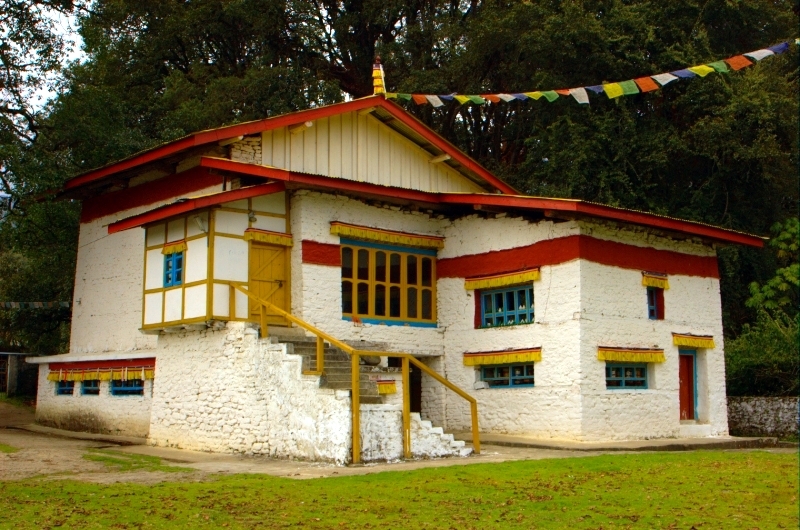 Birthplace of the 6th Dalai Lama (Urgelling Gompa) in Tawang. Tawang is home to Monpa Tribes, who are Mongoloid descents, believed to be immigrated from Bhutan and Tibet. Tawang is known for its natural beauty. There are many hot water springs, waterfalls, lakes, etc, in Tawang. Tawang is famous for River rafting in Tawang-Chu and Namjang-Chu rivers. Tawang is also famous for other adventure activities like Paragliding, Rock-climbing, Skating, Winter sport activities, etc. Snowfall occurs during the months of December and January and ice skating is popular during that time. At 17 kilometers distance from Tawang city, lies the beautiful Pankang Teng Tso Lake (PT Tso lake or PTso Lake). Best time to visit the Lake is from April to October, when it is summer. During winter the lake remains frozen. The lake and its surrounding areas are a wonderful place , with its gushing river waters, Himalayas, colorful birds, colorfull flowers, etc. Jong–nga-tseir Lake is another lake at 42 kilometers from Tawang city, which was formed in 1973 due to a flash flood. The bare trees (without leaves) are a wonderful place for a tourist and photographers. Bab-Theng – Khang Watrerfall is a beautiful fall at around 80 kilometers distance form the town, on your way to the Famous ‘Gorzam Chorten Stupa’ (or Gorzam Stupa) in Zemithang. “Phong-Phongma waterfall ” or “Jang waterfall” or Nurongneng waterfall”, at Nyamseir, is another beautiful fall at around 40 kilometers from Tawang town. “Gorzam Chorten Stupa” at Zemithang is at around 92 kilometers from the town of Tawang. This Stupa was constructed by Lama Prathar in 13th Century A.D and stands on a 186 feet base and is 93 feet in height and is modeled after the “Boudhinath stupa” of Nepal. Sela Pass at 13,714 feet above sea level is a beautiful place on your way to Tawang. The Iron bridge over Tawang – chu river, built during 1420 -1430, is at around 25 kilometers from the town. There is a war memorial, “Namgyal stupa”, at a distance of one kilo meter from the town, in memory of the 2420 martyrs of India-China war of 1962. Tawang is home to one of the biggest Buddhist monasteries, Tawang Monastery. It is also known as “Galden Namgyal Lhatse”, founded by Mera Lama Lodre Gyasto in the 17th century, as per the wishes of his contemporary, the 5th Lama, Nagwang Lobsang Gyatso. Tawang Monastery has a gold painted statue of Gautam Buddha, having a height of 8 meters. Tawang Monastery is the biggest Buddhist monastery outside of Tibet. The current and 14th Dalai Lama, Tenzin Gyatso, when attacked by Chinese military in 1959 March, escaped to India and stayed for a few days at Tawang Monastery, before going to Tezpur in 18th April 1959. Shortly in 1959, Dalmi Lama established the Central Tibetan Administration head-quarters at Mussoorie and later shifted it to Dharamsala in 1960. The “Parkhang Hall” which houses a library has huge collection of rare hand-written and block-painted manuscripts of many revered books for the Buddhists. ‘Teaching of Lord Buddha’, a 108 gold-embossed manuscripts, is kept here. 225 volumes explaining the teachings of Gautham Buddha are also kept here. These volumes of Buddha’s teachings are specially covered with moth proof silk coverings with paintings. There is a Craft Center which produces colorful woolen carpets. “Urqelling Monastery” is another Monastery in Tawang, where The only Indian Lama, The 6th Dalai Lama, Urgelling Gompa, was born. How Do I Go to Tawang? Guwahati in Assam is the nearest major town with rail, road and air connectivity with the rest of India. Guwahati city is at around 450 kilometers from Tawang town. Bomdila is the nearest bus station to Tawang at around 180 kilometers distance. Tezpur airport alias Salonibari Airport with IATA code ‘TEZ’, in the state of Assam is the nearest airport to Tawang, which is connected to the “Netaji Subhas Chandra Bose International Airport” (earlier known as “Dum Dum Airport “), Kolkata. “Rangapara Junction” in Assam is the nearest railway station to Tawang. Being a restricted area, tourists (Indians and Foreigners) are required to get Permits to go to Tawang, details of which are available here, at the official website of Tawang district. Indian citizens can apply for the Inner Line Permits online here . Speleologists Heaven : – Meghalayan Caves are among the some of the longest and most sought after caves in India. There are around 1000 caves in the North-Eastern state of Meghalaya, India, This makes Meghalaya state a Speleologists Heaven (i.e. Cave researchers). Speleologists Heaven of Meghalaya. Jantia Hill’s cave Expedition in progress. Photo Source : Creative commons File Source : F Simpson. File Author : Biospeleologist. The Caves are the main Shillong tourist places in Meghalaya. Krem Dam Cave, the largest cave in length Indian sub-continent with a length of nearly 1297 meters, is the cave which is regarded as one of the best cave, bestowed with nature’s beauty. Krem Dam Cave is a sedimentary rock formation with deposits of quartz alone and quartz with feldspar. The cave entrance is a huge one, which is the main attraction of this cave. This is in contrast to other caves of India, which has narrow entrances. The blue waters from a stream stretches across the primary passage-way of the Krem Dam cave, which makes one of the best and mesmerizing ambiance; Making it a Speleologists Heaven. Krem Mawmluh Cave is 4503 meters in height. Five rivers pass close to the cave of Krem Mawmluh. Krem Mawmluh Cave is made of stalagmite formations. Krem Mawmluh Cave is situated at around half kilometer distance, on the western side of Cherrapunjee. Krem Mawmluh Cave is the forth largest cave in India and is also a Speleologists Heaven. Mawsynram Cave is made of stalagmite formations which looks like a “Shivalinga”. This caves is known locally as “Mawjymbuin”. Mawsynram cave is located at a distance of 56 kilometers from Shillong at Mawsynram village. Those with trekking exposure can go to the peak of the rock formation, from the base of the stalagmite formation by upward trekking, The view from peak point is one which is worth trekking; it gives a clear view of valley, the plans and the gushing river waters of Bangladesh. “Symper Rock“, an extra-ordinary formation of rocks, close to the Weiloi Village, is at a distance of 1.5 kilometers from the Ranikor – Balat – Mawsynram – Shillong Highway. The body of this rock formation resembles a dome and this rock formation ascends all of a sudden, from among the hillocks of nearby region. Mawsmai Cave alias “Krem Phyllut” is close to the Nohsngithiang Falls. Mawsmai Cave has huge halls and gallery‘s which interconnects the different cave halls. Mawsmai Cave entry point is near to Cherrapunjee, the place which receives the maximum rainfall in India. This cave is pitch dark and torch light or candles are required to see this wonderful cave. The light gets reflected in a large number of crystal colors. Siju cave alias Dobakkol (meaning bat’s cave) is on the banks of banks of River Simsang,near to the Siju village. Naphak Lake lies close to Siju cave. This cave is a stalactites lime-stone formation which looks like the Blue Grotto caves of Isle of Capri. Siju cave is the third longest cave in India. Siju caves are situated 30 kilometers on the northern side of Baghmara. Krem Kotsati, a 3650 meters lengthy cave, is another cave which has eight entrances! You have a wade through a pool of water with appropriate swimming wear, if you are entering from the main entrance. Otherwise, you may have to depend on inflatable rubber boats or swim, to enter this case, as river waters surrenders the cave at Krem Kotsati. Krem Lashinng is another major cave at 37 kilometers from Jowai. The cave is a large one with a length of 1650 meters, width of 50 meters and 40 meters in height. This cave is covered with mud and is very slippery; a dangerous cave without the help of guides. Months preceding the monsoon season, i.e. Fbruary and March, are the ideal season to visit the Krem Lashinng cave. Krem Soh Shympi is another deep cave situated at Mawlong village, with 20 meter deep pot-hole entrance and a length of 760 meters. Krem Umshangktat is one of the most sought-after Speleologists Heaven in Meghalaya. The entry into this cave needs tedious trekking. This cave has a length of 955 meters and the entrance to the cave is 350 meters in width. Krem Laitprah or Um Imladit is the longest cave In India with a length of approximately 22 kilometers. This is also in Meghalaya state. Krem Sweep, at a distance of 47 kilo meters from Jowai, is another major cave in Meghalaya, famous for its stalactite and stalagmite formations. Ho Do I Go to The Speleologists Heaven in Meghalaya? Meghalayan Caves which are considered as Speleologists Heaven can be accessed from Cherrapunjee. Cherrapunjee Town is located at around 85 kilometers from Shillong, the capital of Meghalaya. Guwahati in the state of Assam is the nearest airport at 128 kilometers from Shillong.